‘Scratch the earth and you will find an Empire’ is an adage that suits Carmarthen admirably. Around AD 75 the Romans built a fort, naming it Moridunum, Brythonic Celtic Moridunon (=sea fort) from which Carmarthen derives its name. The fort was located in the King Street/Spilman Street area and a trading settlement quickly developed to the east. By the second century this had grown into a substantial town, one of only two in Wales. It was constituted as a civitas, the administrative capital of the Romanised Demetae, from which the ancient kingdom of Dyfed took its name. Moridunum was laid out with formal ‘gridiron’ streets, enclosed by walls and gates which were so prominent that even today the street layout of eastern Carmarthen still respects their alignment. Viewed from the air, the outline of Moridunum’s defences can be traced as a characteristic ‘playing-card’ shape enclosing some 30 acres (12.5 ha). At the eastern end of Priory Street stands the amphitheatre, which is open to the public. The scraps of history that exist from the ‘Dark Ages’ have been blended with mythology and tradition. Over 600 years span the period between the departure of the Romans and the arrival of the Normans in 1093. When they arrived, they found a Welsh religious community in control of the now ruined Roman town. Dedicated to Teulyddog, this was soon to become St. John’s Priory. Caerfyrddin, as the town is known in Welsh, became associated with Merlin (Welsh Myrddin), especially after it was given currency in the 12th century by Geoffrey of Monmouth in his History of the Kings of Britain. The Black Book of Carmarthen, written at the Priory, contains Arthurian legends and tales of the Mabinogion including Merlin, a character who is sometimes a prophet and sometimes a ‘wild man of the woods’. The Merlin prophesies foretold the coming of a British champion who would defeat the Anglo-Saxons. The Merlin tradition is deeply rooted in Caerfyrddin – the ‘fortress of Merlin’, although the name ‘Merlin’ actually derives from Caerfyrddin and not the other way around. 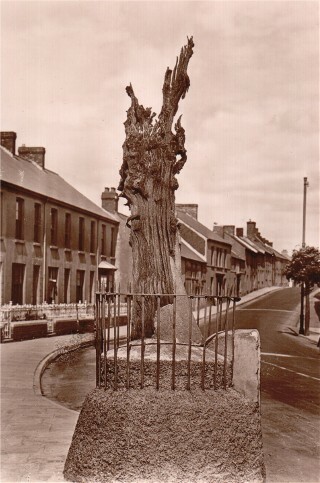 The Merlin legends, in time, took on a more local character, including one relating to the Old Oak, or Merlin’s Oak, a tree that formerly stood in Priory Street. Fragments of the tree are preserved in the foyer of St. Peter’s Civic Hall. The prophesy stated ‘When Priory’s Oak shall tumble down, then so will fall Carmarthen Town’ which led to the oak being shored up with concrete and bands of steel when the tree died in the 19th century. Sad to say, the needs of the motor car saw the tree’s final removal in the 1970s, although the town survived! Other legends and prophesies abound and were eagerly exploited by the townsfolk, including an old widow who showed Merlin’s apparent abode in Priory Street to tourists in the early 19th century. Three miles east of the town stands Merlin’s Hill, which contains the remains of a large Iron Age hill fort. There is a magnificent view from its summit. The history of Carmarthen in the Middle Ages is a history of two towns - New and Old Carmarthen. William II (Rufus) was the first king of England to recognise Carmarthen’s strategic importance. Fearful that the free-booting Norman warlords would dominate Wales at his expense, the King decided to establish a royal stronghold by building a castle at Carmarthen. Thus started the town’s long history as a royal judicial and administrative centre. By the early 12th century a new castle was built at the present site, whilst the Welsh religious community in control of Moridunum was converted into an Augustinian Priory. Thus two towns developed, each with their own chartered privileges; ‘Old Carmarthen’ administered from the Priory, and ‘New Carmarthen’ from the castle. 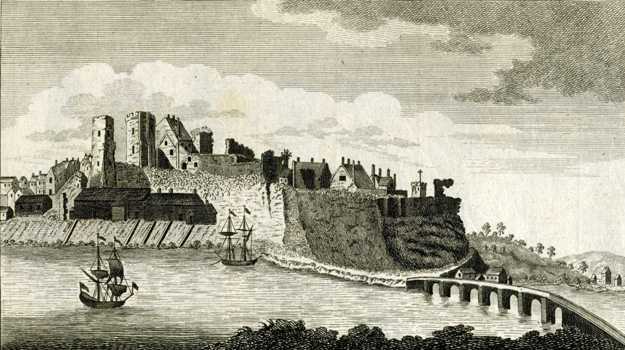 New Carmarthen developed rapidly and its town walls were converted to stone by 1233. During Edward I’s final solution for the subjugation of Wales, Carmarthen became the capital of the Principality of South Wales. By the end of the 13th century the town had grown massively. Already completed were the town walls and gates. The castle was remodelled using the latest military architecture, and stone had replaced timber for the bridge. St. Peter’s Church had reached its present size and St. Mary’s Church had been built, although the latter now survives only in the name of St. Mary Street. The double-cloistered Franciscan Friary was as large as any provincial friary in Britain. 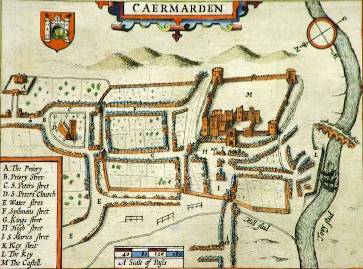 Old Carmarthen, whilst not as large, had its Priory which was one of the most valuable at the end of the Middle Ages. Both the Friary and Priory played a major role in the cultural life of Wales where many notable Bards wrote and recited, including Tudur Aled who was buried at the Friary. The Friary was a favoured resting place of county families and included tombs of Edmund Tudor, father of Henry VII, whose remains were moved to St. David’s Cathedral after the Dissolution and Sir Rhys ap Thomas, who was likewise moved to St. Peter’s Church. During the Reformation, the two towns were amalgamated under a new charter of Henry VIII, following the dissolution of the Priory and the Friary. This charter gave the borough the power to have a Common Council and Mayor. The Mayor was also appointed Admiral of the Port with jurisdiction from the bridge to the sea. The present town’s regalia, including its sword, maces and silver oar, are important reminders of this formative period of democratic growth. But these were also troubled times with religious conflict resulting in a public burning ‘at the stake’. Bishop Ferrar was one of the first Protestant martyrs during the Marian reaction and his gruesome death is commemorated by a plaque under the monument in Nott Square where the event took place. Nevertheless, Carmarthen prospered, being described as ‘the ffarest Towne in all South Wales, and of most Scivillytie’ in 1548. The gentry now built large ‘town houses’ within the borough. At the same time a grammar school was founded within the old Friary, and when that failed another was founded during Elizabeth I’s reign, which survived into the 20th century as the Queen Elizabeth Grammar School. Carmarthen was the largest town in Wales, a position it held until the Industrial Revolution. In 1603 it gained a new charter which made the town a county of itself and which is proudly displayed in the Mayor’s Parlour. This resulted in enhanced powers, including various Courts and the right to return its own Member of Parliament. During the Civil War, it was defended by an extensive bastioned circuit which enclosed too large an area to be capable of serious defence. Thrown up in 1644, parts survive on the west side of the town. They are said to be the best examples of Royalist town fortifications to survive in Britain. Carmarthen’s place in the development of learning, the Welsh language and non-conformity cannot be underestimated. Both Bishop Richard Davies and William Salesbury worked on the translation of the New Testament and the Book of Common Prayer here in 1567 at the Bishop’s Palace at Abergwili, now the location of the County Museum. The town’s role in the emergence of Welsh non-conformity is marked by the fact that so many of the leading personalities of the movement hailed from Carmarthen. It was therefore no coincidence that Carmarthen became the home of the Welsh book trade in the late nineteenth century. The Carmarthen Journal proudly boasts that it has appeared weekly without a break since 1810. Although the town was never destined to follow the footsteps of the industrial towns to the east, it was an early centre for tinplate manufacture, based on a blast furnace built in 1747 and tin mills built in 1761. Parts of these survive at Jewson's, beyond Priory Street. For a period, the furnace produced canon for the Board of Ordnance. The tinplate, with the Morgan family’s esteemed ‘MC’ trademark, found a ready market in Europe and Russia. Other industries included tanneries and paper mills. The port of Carmarthen flourished between the sixteenth and nineteenth centuries with echoes of its past reflected in the quay. The South Wales Railway reached Carmarthen from Swansea in 1852. Subsequent lines provided connections to Llandeilo, to Pembrokeshire and to Cardigan along what is now the Gwili Railway. In the modern era, improved road connections via the A48 dual carriageway provide a fast link to the M4 and motorway network. The completion of the eastern by-pass in 1999 further improved connections and reduced traffic congestion locally. Carmarthen remains an important administrative, commercial and educational centre. 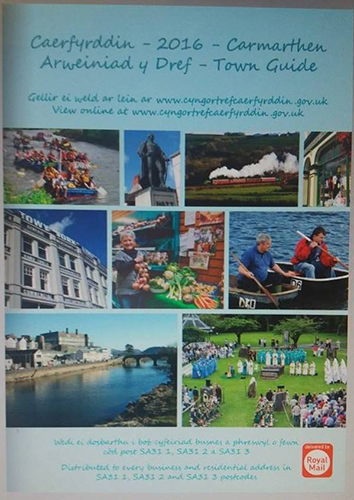 In and around the town are the headquarters of Carmarthenshire County Council, Dyfed-Powys Police, the Inland Revenue, the Department for Environment, Food and Rural Affairs (DEFRA), together with Trinity College and Coleg Sir Gâr. The town avoided the large scale redevelopment that affected many other places in the 1960s and 70s, and has retained the distinctive provisions market which draws shoppers from a wide area. The town has developed as a thriving shopping centre which retains much of the character of earlier periods. Three areas have been redeveloped. The Red Street vicinity was redeveloped in the 1970s to accommodate major retailers such as Marks and Spencer. The land between Lammas Street and Friars Park was developed as a store, with the Greyfriars Precinct (now named Merlin's Walk) opening in 1998, incorporating twenty five shops including many national retailers. In 2010 the former mart site has opened as a new town-centre shopping area, with large stores such as Debenhams and Next, a multi-storey car park and Europe's first all digital, all 3D cinema. The resulting mix of traditional market, local independent shops and major multiples provides a range of facilities exceeding that of many towns with a similar population.